A Reddit user got quite the surprise when she received her gift as part of the site’s Secret Santa program. But when she opened the gift, she realized it was from none other than Bill Gates. So what did the billionaire give as a present? Enclosed with the card was a book and a stuffed cow. But the real present was a donation of an actual cow to Heifer International, an organization that helps to fund education and support small stakeholder farmers. 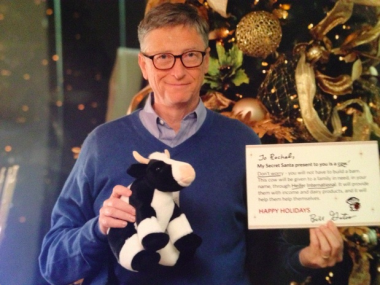 “My Secret Santa present to you is a cow,” Gates wrote in the hand-signed card. “Don’t worry, you will not have to build a barn,” he added, explaining that the cow would be given to a family in need to provide milk and income. To prove he was legit, Gates enclosed a photo of himself with the card. 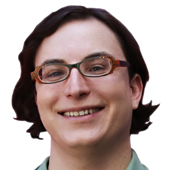 Rachel, who didn’t give her last name, posted her account of the experience on redditgifts.com. It’s Gates’s second experience with Reddit, after taking part in one of the site’s Ask Me Anything events earlier this year. Oh, and perhaps the best part of Rachel’s post on having Bill Gates as her Secret Santa was this postscript.